With the latest update of iOS, there are some kinds of issues cropping up for iOS device users, be it an iPhone/iPad/iPod Touch. If problems like – messages app is suddenly empty after iOS 11.3 update happens to you, you are not the only one. When the messages app in your iPhone behaves in such a weird manner and eventually disrupts proper communication, seeking a feasible solution is of grear importance. 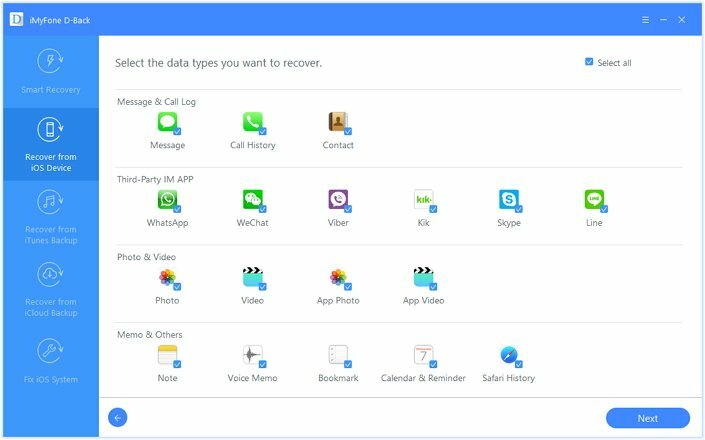 Through this article, we are going to explain you how to resolve the issue of messages/iMessages randomly getting deleted from your iPhone after iOS 11.3 update. If you find the text messages or iMessages are out of order on your iPhone, you can check the solutions here. If your iMessages doesn't say delivered when you send an iMessage out, check solutions here. If there is not enough storage on your iPhone, this problem might appear. Go to Settings > General > Storage & iCloud Usage. 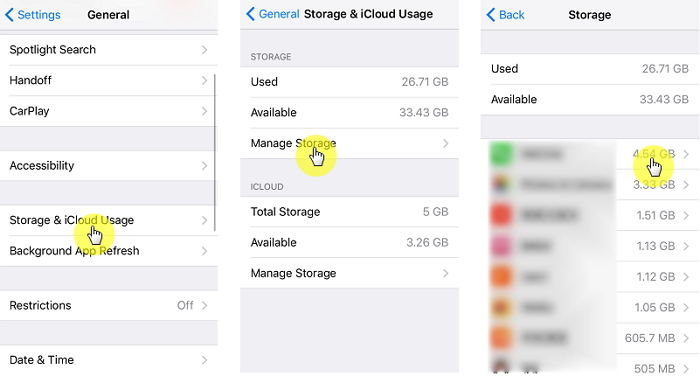 If there little available storage on your iPhone, just click Manage Storage and deleted some unwanted apps. Once you have done that, please restart your iPhone. Sometimes the iMessages/Messages are not really cleared. It just gets some glitches after iOS 11.3 update, so that the iMessages/Messages cannot be displayed. This can be fixed by force restarting iPhone. 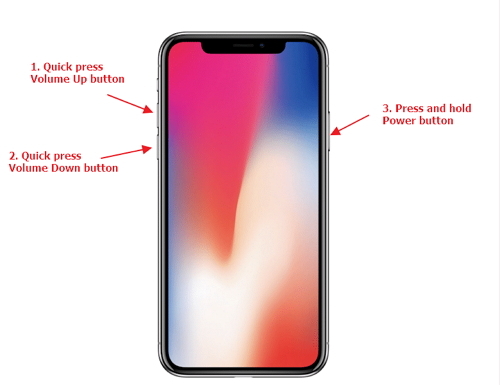 For iPhone 6 and earlier versions, just press 'Power' and 'Home' buttons at the same time until Apple logo shows up on screen; for iPhone 7 and 7 plus, press 'Volume Down' instead of 'Home' button; for iPhone 8 and iPhone X, quickly press 'Volume Up' button and then 'Volume Down' button, then keep pressing 'Power' button until you see the Apple logo. Launch iTunes on your computer and connect your iPhone using a lightning cable. Once iTunes detects your iPhone, click on it and go to the 'Summary' tab. Click on the 'Restore Backup' option and select the desired backup file from the list appearing on your screen. Now, push the 'Restore' button to initiate the process. 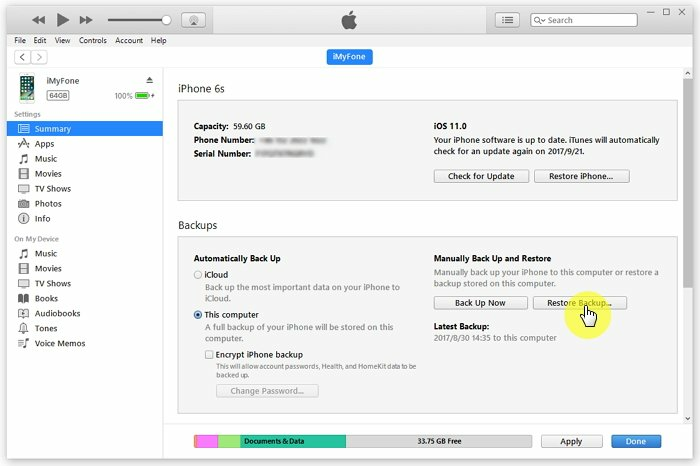 If you want to restore from iCloud backup, please refer to the guide here. 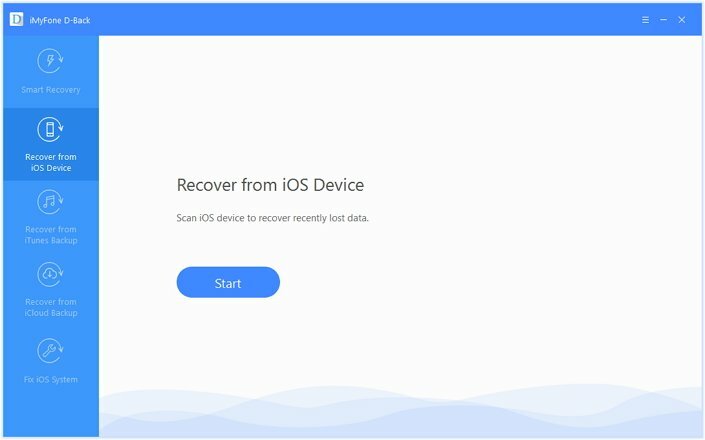 If unfortunately you don't have any backup when iMessages/Messages are cleared after iOS 11.3 update, you can use a data recovery tool iMyFone D-Back to recover the messages/iMessages. 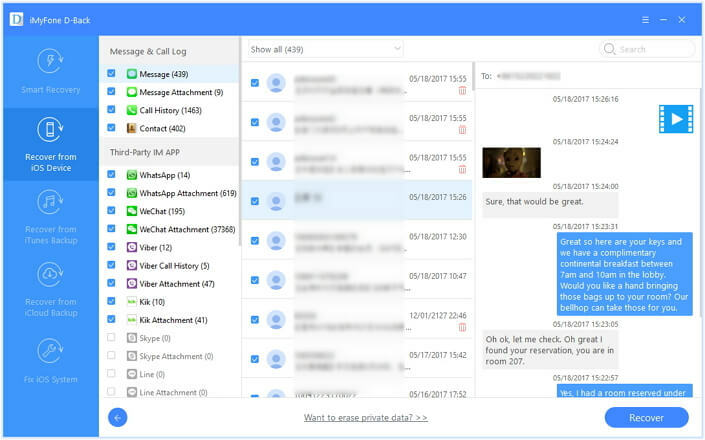 Even when you have no backups, it can recover the messages from your device. It was recommended by famous media sites like Cult of Mac, and Makeuseof. Install and launch the software on your computer. From the left panel of the main screen, click on the 'Recover from iOS Device' tab and then click 'Start'. After that, choose the desired file types you wish to recover. Since we are recovering the iMessages/Messages which are randomly deleted after iOS 11.3 update, in this case you should select 'Messages' from the file types. Now, connect your iPhone when prompted by the software. 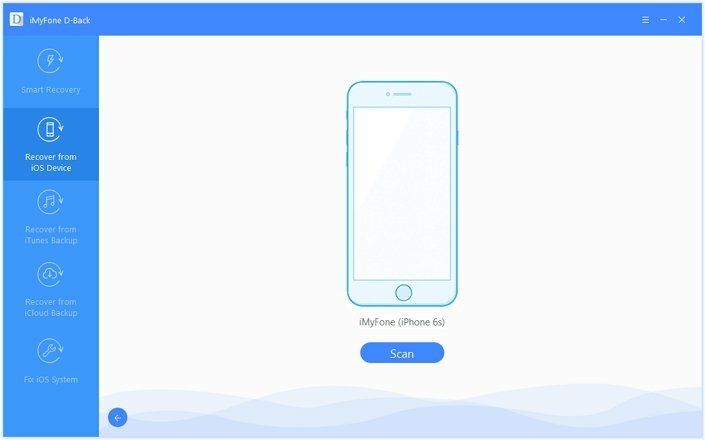 The program will detect your iOS device now. Once it is successfully detected, proceed to click on 'Scan' to get the files found. Once the scanning gets over, click the 'Show only the deleted files' tab to preview all the deleted data. Choose the files that you want to recover and click 'Recover' to initiate the process. Choose the destination location when prompted for saving the files. If you just get back the messages and iMessages, but they disappear or get deleted again, there might be some problem with the iOS. We recommend the following 2 methods to fix the iOS problem. You can also fix iOS issues using iMyFone D-Back without any data loss. 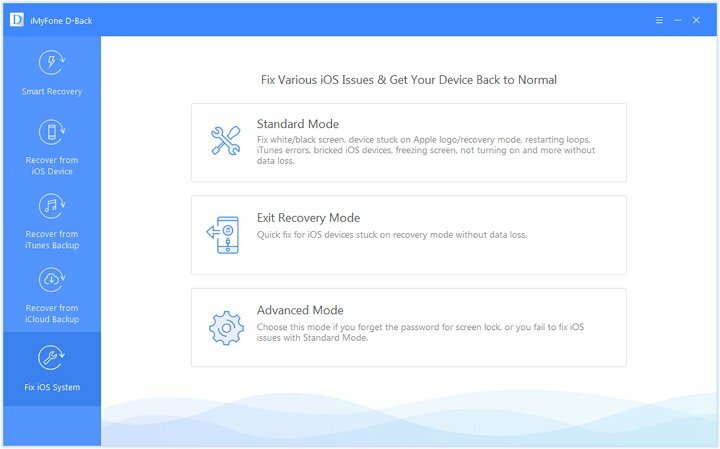 The tool has a feature "Fix iOS System" which can fix various iOS problems including iPhone stuck in recovery mode, white screen, black screen, apple logo, etc. Launch the software and choose 'Fix iOS System' on the main screen. Using a USB cable get your iPhone connected to the computer and tap on 'Standard Mode'. 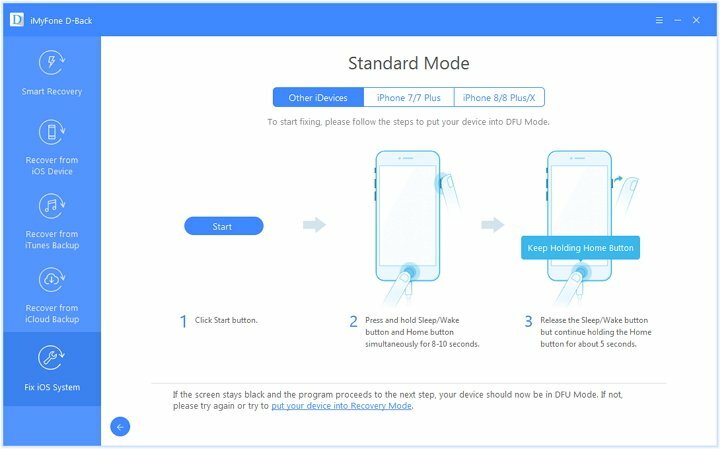 After selecting the 'Standard Mode', go along the instructions on screen to put your iPhone on DFU mode when prompted. As soon as your iOS device enters DFU mode, it gets detected by iMyFone D-Back. It's time to get the newest firmware. For this, just tap 'Download' and wait till it's over. 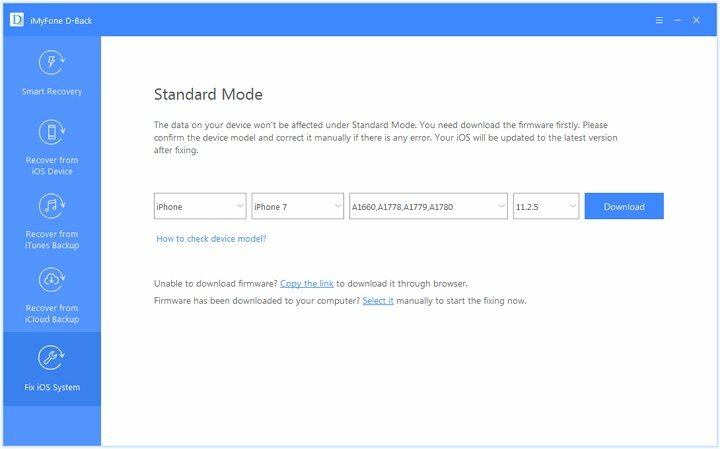 If the program doesn't detect your device, you can enter the details manually. Right after downloading the iOS software click 'Start to Fix' to start the repair process. As soon as the issues are fixed, your iPhone will restart on its own. This will possibly fix the problem that all iMessages/Messages go away randomly after iOS 11.3 update. When iMessages/Messages are randomly deleted after upgrading to iOS 11.3, here is another option you can try to fix the issue. 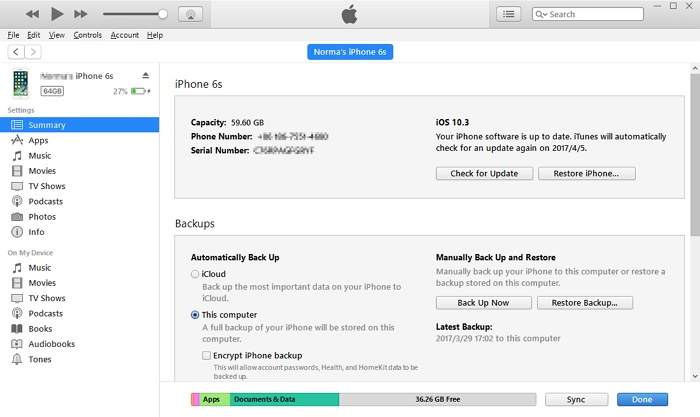 It is factory restoring your iPhone with iTunes. Let's see how to do it. Launch iTunes on your computer and get your iPhone connected through a USB. Once iTunes detects your iPhone, click on the device icon and tap the 'Summary' option. Click 'Restore iPhone' and then tap 'Restore' to confirm.